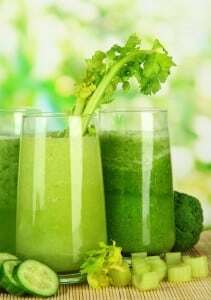 Press the apple, celery, lemon, cucumber, and kale through the juicer. If you don’t have a juicer, you can combine the ingredients with enough water to cover in a counter top blender and blend until smooth. Whisk in the aloe juice and serve immediately. Explore other recipes for living juices.